Evaporation of atmopheric helium on the giant exoplanet WASP-69b. Credit: Gabriel Perez Diaz, SMM (IAC). 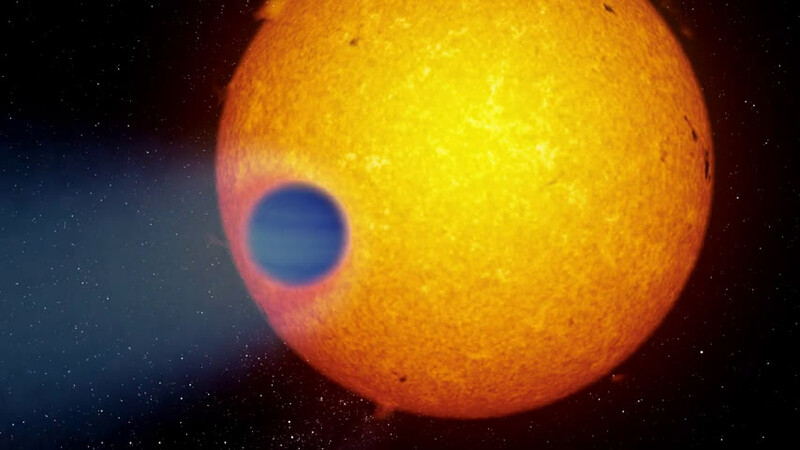 A new study led by scientists from the Instituto de Astrofísica de Canarias (IAC) reveals that the giant exoplanet WASP-69b carries a comet-like tail made up of helium particles escaping from its gravitational field and propelled by the ultraviolet radiation of its star. The results of this work are published today in the journal Science. To detect the atmosphere of the giant exoplanet WASP-69b, the scientists used the CARMENES instrument, which is installed on the 3.5-meter telescope of the Calar Alto Observatory (located in Almería, Spain). This spectrograph simultaneously covers the visible wavelength range and the near-infrared at high spectral resolution. 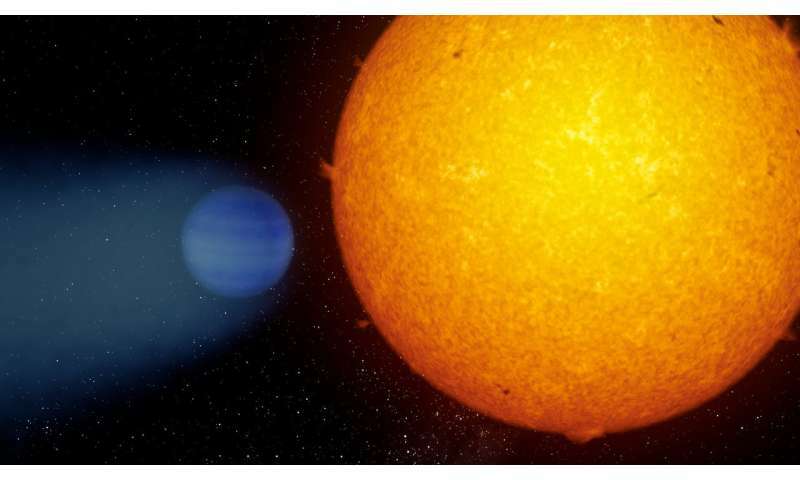 This has made it possible to reveal the composition of the atmosphere of this exoplanet and to draw conclusions about the speed of the helium particles that leave the gravitational field of the planet and the length of the tail they produce. The planet was observed during a transit, when it passed in front of its host star. During this event, the planet and its atmosphere eclipse part of the starlight. "We observed a stronger and longer-lasting dimming of the starlight in a region of the spectrum where helium gas absorbs light," says Lisa Nortmann, a researcher at the IAC and lead author of the article published today in the journal Science. "The longer duration of this absorption allows us to infer the presence of a tail," she adds. Evaporation of atmopheric helium on the giant exoplanet WASP-69b. Credit: Gabriel Pérez Díaz, SMM (IAC). The team also investigated the host stars of the five exoplanets using data from the European Space Agency's Multi-Mirror X-Ray Mission (ESA XMM-Newton). They detected helium in the atmospheres of those planets that receive the largest amount of X-ray and extreme ultraviolet radiation from their host stars. "This is a first big step toward finding out how exoplanet atmospheres evolve over time, and what the distribution of masses and radii of the observed population of super-Earth and mini-Neptune planets could result from," says Enric Pallé, IAC researcher and co-author of the publication. The results of such studies could confirm that extreme radiation from the host star can strip the gaseous envelope of giant planets (similar to Jupiter or Neptune) and turn them into rocky planets with densities similar to Venus or Earth. "In the past, studies of atmospheric escape, like the one we have seen in WASP-69b, were based on space-borne observations of hydrogen in the far ultraviolet, a spectral region of very limited access and strongly affected by interstellar absorption," says Michael Salz, a researcher at the University of Hamburg and first author of a companion publication by the same team, which focuses on the details of the detection in HD 189733b to be published in the journal Astronomy & Astrophysics. "Our results show that helium is a very promising new tracer to study atmospheric escape in exoplanets." This new finding is going to open a whole new can of worms for the nebular model of planetary formation. People will be making estimates of how much Helium is present in the planet, what the rate of escape is and assuming it is constant how long such a process can continue before depletion of the source. The answers will certainly be entertaining if nothing else!